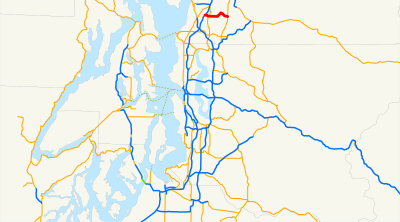 On Saturday, November 14, 2009, we drove the unfortunate length of Washington State Route 96, from south Everett to the Snohomish valley. Beginning at a junction with state route number 5 in the vicinity south of Everett, thence easterly to a junction with state route number 9 in the vicinity of Ree's Corner. 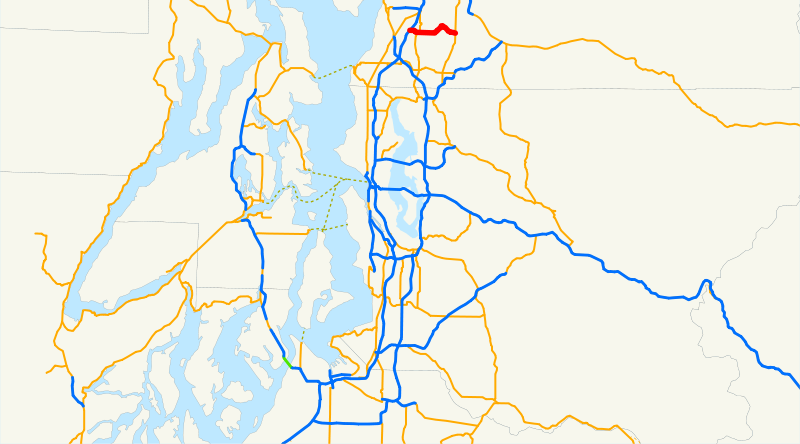 SR 96 was added to the state highway system in the early 1990s because population growth dictated that southern Snohomish County needed an east-west connecter that wasn't just a winding two-lane road. So here it is at I-5, a wide urban arterial highway. So far, so good. 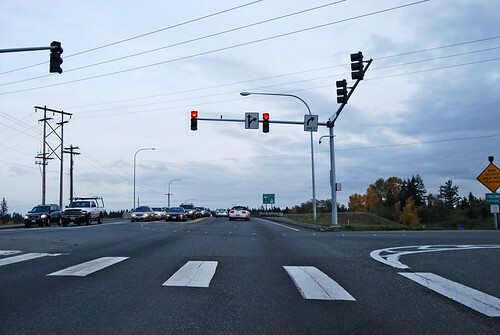 Shortly thereafter, Highway 96 meets the Bothell-Everett Highway, SR 527, which once was part of the Pacific Highway, the main north-south route through the area back in the early 1900s. Highway 96 is still a wide arterial. 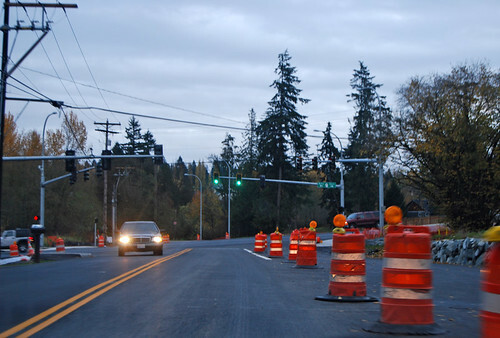 Two miles after SR 527, however, SR 96 abandons the four-lane road and takes a left on Seattle Hill Road, a narrow zig-zagging road down the hill, then a right on another old two-lane road till it ends at SR 9, above, where Highway 9 is currently being widened. Since the whole point of designating Highway 96 was to alleviate east-west traffic problems on narrow, two-lane roads, leaving Highway 96 as a narrow, two-lane road is completely pointless and defeats the purpose. 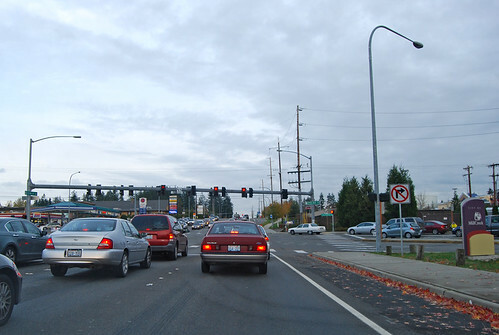 About ten years ago, Snohomish County took matters into their own hands and built a four-lane highway from the Seattle Hill junction down to Highway 9, completing it in 2003. This is now, hopefully, the route that most people take up and down the hill, but the signs still direct any unsuspecting motorists (and truckdrivers? ), who might think that the state highway is the quickest and safest route through the area, along a dangerous little road. The Seattle Hill section of road has recently had landslide problems, so I doubt the county wants it back. I also doubt the county wants to give up the lovely new highway they built. WSDOT, for its part, has other things to worry about, and since the route they now maintain meets the legislative wording, if not the initial intent, that's okay, right? Problem solved. 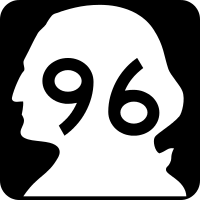 SR 96 should be extended west along 128th Street (a six-lane road with HOV lanes) to SR 99.